Recently, I have literally been caught up in the storm clouds. Maybe because of the drought we have experienced here in Texas. 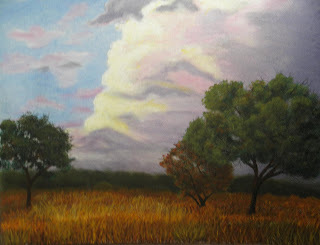 This is an original, 16x20 pastel painting, on Canson matboard, of a passing storm cloud. There was a wonderful sunrise this morning after yesterday's rain. The neighbor's cat dropped by to check out my fishing hole. A little relief from our drought! Thankful for every drop! This is not just a ''oops'' but a major ''oops!'' I have been working hard,'' taking advantage of the world wide web'', to get my art seen. I built a website, took to blogging, got on Facebook, entered Facebook art groups. Now, I find out that it is not appropriate to use the word ''gallery'' in an artists website or blog. As I have used the word ''gallery'' in both my website and my blog. My website and blog are also on my business cards. I have some major decisions to make and work ahead of me if I decide to give them both a new name. I can either act innocent and leave things as they are or make all the changes that are necessary to be appropriate. While I want to appear professional and do things appropriatly, if I change my blog name the result will be that I loose my followers. And there is the wasted business cards. I think I will need to think this over and weigh the pros and cons. I would like to hear what other artists and galleries think about this. Here in Texas, there are little hidden streams on every country road. Dry streams most of the year, but after a rain they come alive. Small and overgrown they are hidden from view by all except for the most curious passerby. I found this one in San Saba County, Texas. The bright sun seemed to cast a golden sheen on the rocks and water and a small patch of blue reflected from the sky. A Quiet Place is a 16x20 acrylic painting. Painted from a photo that I took in the spring. This is a crossroad in San Saba County, Texas. 16x20 acrylic painting. I knew something was not quite right with this painting, so I posted it to be crytiqued on an artist magazine site. I got a lot of ideas on improving it, some negative remarks and also some positive ones. The negative remarks brought me down for a while, but I will not let them keep me down. Eventually, I will work on this again and see if I can improve it, if not it will not be a wasted cause as any painting I do can still be a learning experience for me.